Getting a standard approach to projects in place takes more than finding the right process and templates. Your team also need to use the new tools consistently to improve project outcomes and measure overall progress. Download the free SharePoint Project Management Template to standardize your projects in just a few clicks! Consistency requires a commitment to making a lasting change. Using a pre-planned project template makes that initial commitment a little easier! In this article, I’ll take a look at why you should use a project template, introduce a free template from SharePoint, and offer some tips on getting your team to use a template consistently. Why Should I use a Project Management Template? In order to avoid common project management pitfalls, it’s important to have a common project management approach, supported by templates, in place. Provides a basic framework for the project’s structure. Saves time during project set-up and execution, leading to faster delivery times and improved time-to-market. Helps to manage expectations about how and when project information is shared with the team and stakeholders. Increases productivity by reducing the need to learn new processes regularly. Creates accountability by improving project tracking and visibility into progress. Ensures compliance with processes, policies, and any industry-specific regulation. Acts as a training resource for new project managers and team members, especially those who lack formal project management training. Taking a template-based approach to projects makes it easy to improve project standards throughout your organization. Once a template is tried and tested, it can be reused repeatedly. As your project management needs grow, it’s also simple to modify existing templates or create new templates to support your evolving requirements. 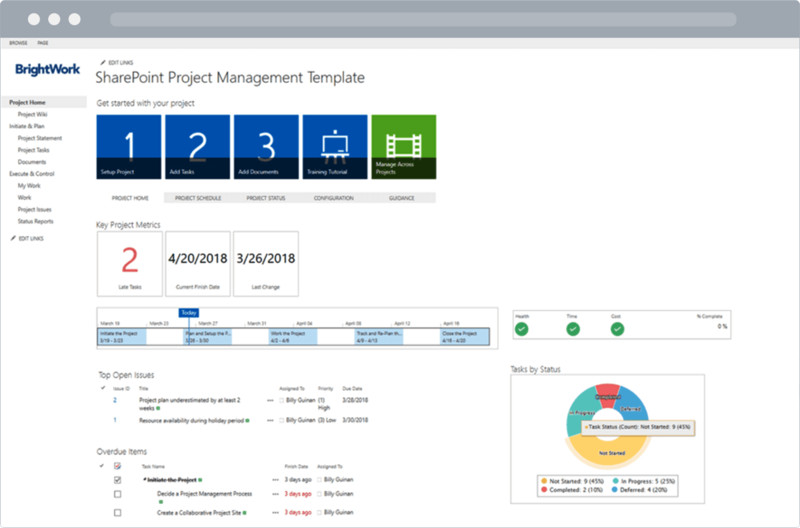 As you’ll see in the next section, the free SharePoint Project Management Template from BrightWork ships with all of the project management essentials you need for a quick, standardized start. If your organization is already using SharePoint, you can configure a site template to meet your requirements. If that sounds tricky, the Free Template from BrightWork will plug straight into your existing infrastructure with no coding or configuration required. The template will help you to organize all project information in one central location, making it easier for the team to follow a single project approach. The free template works on SharePoint 2010, 2013, 2016, 2019, and SharePoint Online. To find out more about using the free template with a simple project management approach, read our online guide, How to Use SharePoint for Project Management. As I mentioned above, picking a project management approach and template is a key first step towards project standardization. With these elements in place, you can now drive consistent use of a project management template. How do I Get My Team to use a Project Template Consistently? ‘Steadfast adherence to the same principles, course, form, etc’. ‘Agreement, harmony, or compatibility, especially correspondence or uniformity among the parts of a complex thing’. Consistency also describes ‘harmony of conduct or practice’ and ‘the quality of achieving a level of performance which does not vary greatly in quality over time’. In short, consistency is a repeated, agreed way of doing something that can lead to improvements in time. Sounds like an ideal goal for any project team! Consistency is core to how we make decisions. Once we make a decision about something, we refer back to that decision in the future. Consistency thus acts as a mental shortcut or reference, saving time and energy. Consistency is typically viewed as a positive personal trait – so much so that we work hard to ensure our actions reflect our beliefs to appear ‘consistent’. We even prefer to change our beliefs to reflect our actions to seem consistent to others! Consistency works in tandem with commitment, a promise or agreement to do something. Commitment helps us to do something we agreed to do consistently. As a project manager, you have two challenges when improving consistency. Firstly, you should pick your project management process and stick with it during project execution. Secondly, you need to get your team to follow your processes consistently, which requires a commitment to the desired approach. Let’s take a look at these two elements separately. Much like a project management template, consistency makes it easier to track and improve performance whilst helping team members to focus on what matters. Consistency in project outcomes and communication will also help you to develop positive working relationships with your clients and stakeholders. Regardless of the project management approach or tool you choose to use, you need to use it consistently during the project. Your leadership is a model for the team. Being consistent about project execution, including tasks, meetings, reporting, documents, and issue management, will create trust with your team and eliminate any uncertainty about ways of working. Next, you need to get your team onboard. Consistency and commitment need to be self-motivated; the person should want to make a change. The most effective way to do this is to gather the input of the team about a problem before agreeing on some next steps together. Imagine you want to reduce project overrun by improving task tracking during execution. Your team updates their task on an ad-hoc basis, making it impossible to identify and address problems quickly. A task tracking system is in place, but no one uses it. In a workshop session, discuss the importance and benefits of consistent task tracking with your team. Find out why people find it hard to update their weekly tasks and gather their ideas about making this process simpler. Once the team understands the significance of task tracking, it’s time to ask for an action! Start by asking the team to commit to updating their tasks in your project tool before the weekly team meeting every Monday morning. By promising to make this update, your team will be more likely to commit to this action consistently. Using a task tracking report, it will quickly become apparent who is or is not living up to this commitment. Remember – we want our actions to show we are consistent and reliable! In time, you can ask your team to commit to following new project processes such as switching to SharePoint for project management or using a standard template for project documents. Get started with your Free SharePoint Project Management Template now. Editor’s Note: This post was originally published in October 2012 and has updated for freshness, accuracy, and comprehensiveness.